"Hi Everbody" I am Dr. Ralph Wiggum. I am here to add stuff to this Site (e.g., on simpsonspedia pinched) and fix things. If you copy a page from Wikipedia remove any red links unrelated to the Simpsons. Don't be afraid to upload images, they will not harm your computer. If you see a list on an article please give the list its own article. Talk pages are not blogs so do not place any personal opinions I.E. I like Bart. Do not add any speculation on stuff that hasn't been confirmed. If there are two alike pages try to redirect the bad one to the good one. Major Characters: Should have sections on important facts revealed about them, various personality traits, character origins, and if revealed a little on the character's past. Do not add quotes or lists as they mess up the balance of the page. One-Time Characters: Should have a section on their appearance, a section on minor appearances, character origins, and upcoming appearances. Minor Characters: Should have the same layout as one-time characters. Tracey Ullman Shorts: A section on the plot summary of the short just with major details, and trivia section with facts about first appearances or characters who did not appear or speak in the short. Episodes: A section on the plot summary of the episode with just major details, a trivia section, a section on errors (do not name the section goofs), a section on cultural references, a section on production notes, and a section on viewer reception. Do not copy the plot from Wikipedia as Wikipedia summaries are written in an out of universe style meaning that minor plot details are placed in the plot as well. Also, do not put quotes on episode pages as they kind of mess up pages. Quotes should stick in Wikiquote. Itchy and Scratchy Episodes: Should have a plot summary, and a trivia section. 7:00 PM: Bart vs. Australia - Bart makes a prank call to Australia and then Milhouse takes Bart to the bakery and Bart leaves the phone on. Soon Bart has to pay $900 for the call and then The Simpsons have to go to Australia. 11:30 PM: Homer Simpson, This Is Your Wife - Homer enters the family in a show where he has to swap wives. Guest Starring Ricky Gervais. 7:00 PM: Homer vs. Patty and Selma - Homer accidentally bankrupts Patty and Selma. Bart is forced to take a ballet class. Guest Starring Mel Brooks and Susan Sarandon. 11:30 PM: Million-Dollar Abie - Grampa tries to kill himself after he ruins Homer's chance of opening a Football Stadium. Guest Starring Rob Reiner. 7:00 PM: A Star Is Burns - The Simpsons hire a film critic to help them in a film festival. Guest Starring Jon Lovitz and Maurice LaMarche. 11:30 PM: Kiss Kiss Bang Bangalore - Mr. Burns outsources the power plant to India and Homer becomes the new boss and eventual God. Patty and Selma kidnap their favorite TV star. Guest Starring Richard Dean Anderson. 7:00 PM: Lisa's Wedding - A carnival fortune teller tells Lisa her future. Guest Starring Mandy Patinkin. 11:30 PM: The Wettest Stories Ever Told - While waiting for their food at a resturuant The Simpsons tell three sea stories. 7:00 PM: Two Dozen and One Greyhounds - Santa's Little Helper has 25 children which get tiring and are sold to Mr. Burns who plans to turn them into a sweater. 11:30 PM: Girls Just Want to Have Sums - Lisa must guise as a boy to get into school. Guest Starring Frances McDoormand. 8:00 PM: Funeral for a Fiend: Sideshow Bob is put on trial and then after his father claims he has gotten a mental illness due to Bart. He must take proper medication for it. Bart however thinks it is a bomb and throws it out the window and accidentally kills Bob. Guest Starring Kelsey Grammer, John Mahoney, David Hyde Pierce, and Keith Olberman. 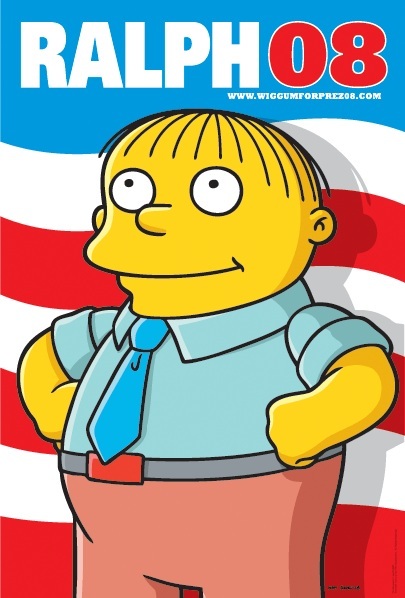 8:00 PM: E Pluribus Wiggum: Springfield's Primary is moved to first in the state and when The Simpsons can't pick a candidate Homer believes the most pathetic person in town should be a candidate and that winds up being Ralph Wiggum. However no one knows what party he is running for. Guest starring Jon Stewart and Dan Rather. Note: If you want to see previously added articles for deletion and old new episodes and repeat posts go to the User:Dr. Ralph Wiggum\Archeive. Modified on June 9, 2018, at 12:24.